The hospital has been in existence for 20 years and this year will be our 21st Birthday, 16 of those years have been devoted to saving Seals along with all the other Wee Biddies Out Back. As many of you who have visited us will know it has been a difficult task taking care of so many Seals without the proper facilities, you are also aware that it has not been to the detriment of their treatment and care, rehabilitation and ultimate release, fat, happy and healthy. 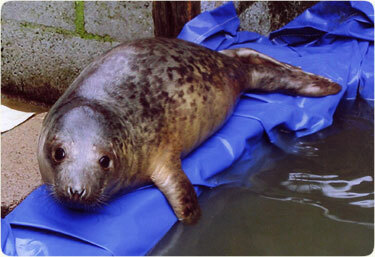 Last Christmas period we took in 5 grey Seal pups, two were very badly injured and all in poor condition. By the second week in May I released the last of the grey pups and by June 1st my first common Seal pup came in, he was premature by approximately three weeks, very small and vulnerable. Shortly after he was followed by another six, all I seemed to do was make up feeds, to be given five to six times a day, oh and take in and look after my bed and breakfast guests plus the other baby species. You guessed right - I was pretty demented by the end of the day; to be honest, during that period one day melted into the next more often than not. 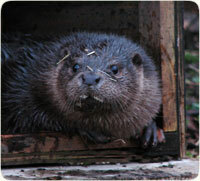 Squirt the Otter cub who came to us December 04 will hopefully be released into the wild this coming spring. She was found at the Inverpolly salmon hatchery one Monday morning drenched cold and very weak, her back legs unable to support her. How long she had lain there was anybody’s guess; it was, after all, over the weekend - one of the worst at that. She was only about five or six weeks old so wouldn’t have lasted much longer had she not been rescued by the boys working there. 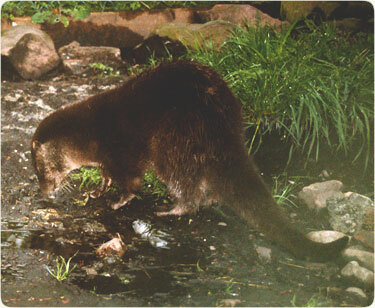 She has been kept fairly secluded from human contact, but on the rare occasions, directly after her pool was cleaned and filling up with the water hose she has provided much joy and insight into Otter behaviour to lucky observers. Her play with the hose confirms she was aptly named. We now have another young Otter, Opal, who joined us in October. She was found at Dundonnell somewhat thin and cold but in better condition than Squirt had been. We have to provide her with a separate pen because it would be unsafe to risk her with the older Otter Squirt which seems such a pity; it really is better to have a pair growing up together, but the age difference is too great now and it’s better to be safe than sorry. I would hate anything to happen to either of them. 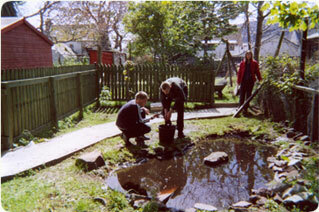 The Ullapool High school projects have been a great success and the four boys involved have worked extremely well creating the small bird aviary (which has stretched to a good 30 x 12 feet); it became larger as we worked on it, I’m very glad now we did extend it because the whole aviary has become a natural garden ideal for wee birds. The Hedgehog village, once more a natural habitat for rehabilitating the hedgehogs in particular those rescued from the Uist island where unfortunately they are being culled each spring. We have had positive feedback from the people who have given them new homes. The boys also created a path, houses for the hedgehogs, a shallow pond that will be studied throughout the years to see what other forms of wildlife are attracted in and around it, bird tables, and a new house for Squirt, which she greatly approves of. The next big project will be concentrating on new Raptor pens with a flight aviary included. 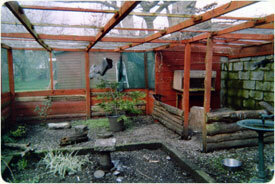 Alas, the extreme weather last January caused a lot of damage particularly to the main Raptor aviary. Joyce Ross of Uist (semi retired rehabilitator) passed it on to Lilah and David Ford “West Highland Hawking and Falconry” in Kinlochewe who brought it to Conanvet, Cononbridge. The vets x-rayed the wing and found a fracture which they felt would heal well if the bird was kept quiet and confined. This is where we came in. Harriet was kept secluded in the hospital unit for several weeks, then transferred to a recovery shed and allowed to just have enough room to fly to and from low perches until we gave her slightly higher perches. Her wing was becoming stronger and it was time for her to go into a flight aviary. We informed Lilah and David, and they came and fetched her and brought her to an aviary in Kishorn. After three weeks it was agreed she could return to Joyce for release. The Fords brought her to Uig and thanks to the kindness of Caledonian MacBraynes, she was Ferried to Loch Maddy free of charge. Joyce was there to bring her home to Benbecula in the Hebrides. There will always be that feeling of trepidation before release, followed by sheer relief and joy as we now know was experienced by Joyce as she let it out of the carrier, watched Harriet flutter forward hesitantly, all of a sudden soar up into the air, swooping, diving and doing what Hen Harriers do. If anyone is interested in sponsoring the boys’ project this coming season it would be most helpful. The usual influx of baby birds come spring and throughout the summer brought children with their precious little casualties in various boxes. Some of the babies were mere hatchlings, (so brand new that they had no feathers yet) identifiable only by their beaks and sounds, especially the starlings they are noisy babes. Thank you Jane, the new recipe went down a treat, the babies simply thrived on it. 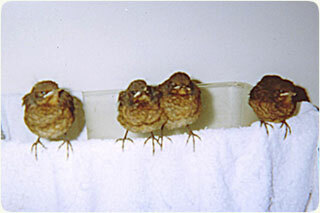 My friend Jane Smith “Elstead Bird Rescue” is the Delia Smith of recipes for all species of bird - a truly talented lady. The new aviary for the small birds proved a great success, the natural garden habitat was just what the young birds needed to adjust and learn for their life in the wild. It’s been a long time since I’ve managed to get my head around a newsletter, mainly because I only have one pair of hands and coping with B&B and the day to day running of the sanctuary has been pretty chaotic. This year however my “Garve Gang” comprising of Jeannie, Bridget and Keith made an enormous difference and I definitely have a clearer view of how I wish to see us progress. My son Robin has come home for a while and will be constructing a new website. This will have up to date news and a more in depth history of the many patients with their incredible stories. We are also considering an adoption and sponsoring programme, video diaries, and lots and lots of pictures. It isn’t practical to open to the public as is constantly suggested to me in order to raise funds, as we don’t run a wildlife park or zoo. Our grounds contain recovering wildlife we rehabilitate for return to the wild and the less contact with people the better. We do not receive funding from the lottery, and most community grants are unavailable to us because we don’t open our doors to the public. This property, Old Bank House, and the large 3/4 of an acre garden owned by Terence Coffey was leased out to my husband in the early seventies. Terence who was an old friend of my husband and I, sadly passed away in February 2004 aged 94. Being aware of the possibility of the Trust we founded in 1990 discontinuing in the event of Mr Coffey’s death, you could say things were certainly tenuous at times for making too many plans for the future of the Trust. Mr Coffey has in fact bequeathed the whole property to The Highland Wildlife Hospital Trust. For one thing I would hope to see The Highland Wildlife Trust become a permanently established organisation continuing long after my lifetime. This can only be done with great commitment and insight for the future, whatever assistance given will be lasting. It would be marvellous to have the proposed new Seal Crèche ready to receive our first common seal pups in June, replace the Raptor aviaries that were blown down by the Gales, have more money to meet the rising running costs of the hospital, which at most is met by ourselves with Bed & Breakfast earnings. Also, to have some organisation or company sponsor a new Ambulance / vehicle which an estate car would suffice. Our Fiat Tempra which has served us so well over the past 10 years and clocked up 120,000 miles carrying countless patients is slowly dying and costing us more than it is worth to keep on the road. We have learned over the past 20 years to be realistic and patient. Little did those who have helped us get where we are today ever imagine this turn of events. Many have passed away but their contributions are lovingly remembered in this living memorial. I would like to pay tribute to John Smith taken so suddenly in a terrible road accident, Dec 2004. John helped build our hospital unit, and dug and filled with concrete the trench surrounding the 12ft x 36ft Otter pen which today keeps Squirt safe until her release. Love and light from BB, Mike, Robin and all the wee biddies. 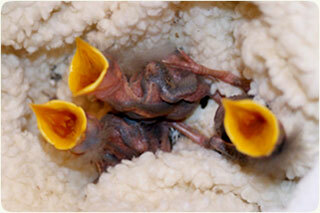 Click here to return to the Highland Wildlife Hospital home page. We can also be contacted at the address below. 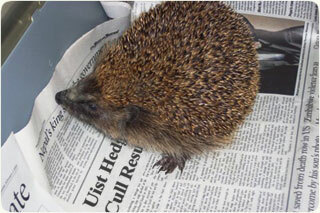 Please make any donations by cheque payable to the Highland Wildlife Hospital Trust.